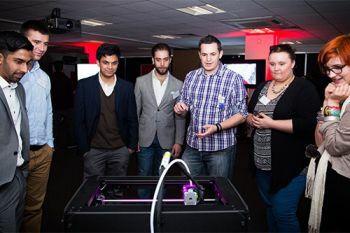 Inaugural competition draws out the best in innovation, creativity and technology from final year students. 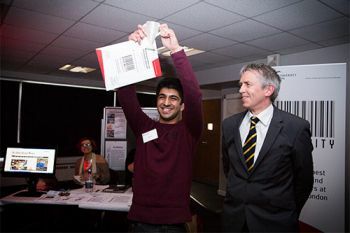 City's inaugural Made@City exhibition and competition took place on 14 June in the Northampton Suite. "Undoubtedly, winning Made@City came with a mixture of shock and amazement. There were some phenomenal projects on display demonstrating great design and innovation. I was already proud enough to have been selected to showcase my own project but the thought of being voted best student project never crossed my mind. The project was definitely the most intricate and complex work I had set out to achieve and at times I thought I would struggle to complete it. The hard work paid off in the end. Being so successful in the competition is definitely one of the highlights of City life that will stay with me." Organised by the Enterprise Office and the Professional Liaison Unit, Made@City showcased and rewarded the best final year project work of students. It also drew attention to the creative use of technology and design. There were 13 student exhibits on display, alongside academic staff projects. The scores of attendees comprised students, academic and professional services staff and representatives from Tech City start-ups. Professor Roger Crouch, Conjoint Dean of the School of Engineering & Mathematical Sciences and the School of Informatics, was also on hand to announce the winner. Other creative displays included a quadrotocopter, a programmable wheelchair and a game for care givers. The Made@City Cup, awarded to Faisal Valli, was printed live during the event, using a 3D printer.